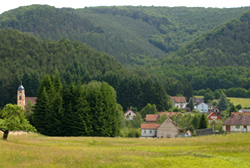 the village is located in the Mosellan part of the "Parc Naturel Régional des Vosges du Nord". The area of this "Parc Naturel Régional" has been declared "Biosphere World Reserve" by the UNESCO since 1989. This distinction represents a real award for all the persons who used to live in this area, for all the work they make in order to valorize the cultural heritage and to protect the natural surroundings. 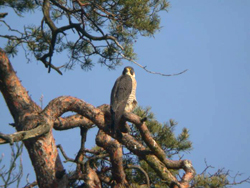 On the Philippsbourg's district, some sites are categorized as 'Natural Reserve", so as the "Peatery" which protects a lot of rare plants species or rocks welcoming the prestigious peregrine falcon. The "Natural Reserve" classification needs particular care which consequently gives Philippsbourg's natural heritage an exceptional character. The irregularities of the landscape offer a lot of sightseeings from hill tops which pass over 400 meters or from tours of some falling into ruins' medieval castles like the "Falkenstein" or the "Waldeck." In the bottom of the valleys, numerous rivers fall into ponds which were created for effective use, 500 years ago. One of them, the Hanau's pond, in Philippsbourg, is the biggest pond of the Bitche County. Nowadays, in its surrounds, the Philippsbourg village fits out a leisure area, the county's residents use to enjoy a lot as well as do the tourists. Trekking lovers or quiet nature supporters, you will appreciate to come and resource yourself in Philippsbourg.